This is the first year that the Alberta Children's Hospital NICU has participated in the Kangaroo Challenge that took place worldwide from May 2-15, 2016. So what is kangaroo care? Kangaroo care is a method of caring for premature babies where the infants are held skin-to-skin with a parent for as many hours as possible each day. Not only does kangaroo care provide a tremendous bonding experience between parent and child but there are numerous health benefits too. Participating in the Kangaroo Challenge helps to open a dialogue between staff and parents, says Sarah Vigar, RN, who is the team lead for this project. It's all about including parents as partners in their baby's care. We want parents to feel empowered and advocate for their child's well-being. I've been blown away by the support and involvement of staff and families. Two parents actually held their son for 24 hours straight! Meet Amanda and Darrell and their son, Grayson. We wanted to try and do as much as possible on our end to help him, other than just being here. The biggest difference Amanda and Darrell have noticed in Grayson is his breathing and their bond as parents. We have learnt so much about his habits, his likes and dislikes when it comes to movements and laying and we're continuing to try new bonding techniques. The ACH logged 637.8 hours of kangaroo care which works out to be 3.5 hours per baby per day! Just to add some perspective &helip; last year's winner, Salem Hospital, logged 2.56 hours per baby per day. Wow! How does Kangaroo Care work? Babies are naked except for a diaper and something covers his/her back; either the parent's clothing or a blanket, hence the name Kangaroo Care. 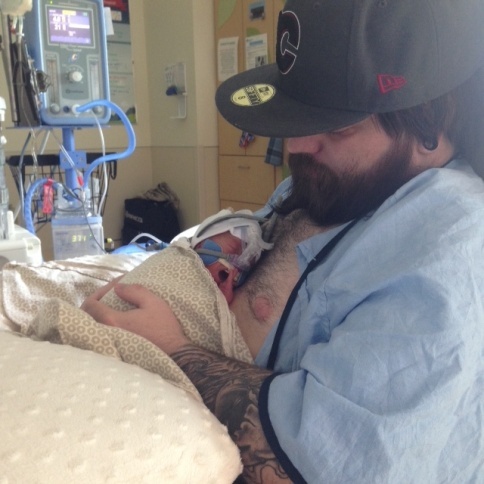 The baby is held in a mostly upright position against the parent's chest, skin-to-skin for as many hours as possible. Depending on the baby, it takes coordination and planning to perform Kangaroo Care. It might take four or five people initially to help parents begin to hold their infants, but it does get easier. We see the huge benefits for both parents and child so we are happy to help parents do kangaroo care. Most parents don't even realize they can ask for something like this so opening the dialogue between nursing staff and parents has been tremendous, says Sarah Vigar, RN at the Alberta Children's Hospital. We hope to continue in this direction after the 2016 Kangaroo Challenge is over. Why is kangaroo care becoming more common in NICU? The benefits are numerous for baby and for parents. For moms and dads, it can mean closure over having a baby in NICU, feeling close to baby (bonding), confidence that they can care for their baby, and a feeling of control. For baby, the health benefits include: body temperature regulates; respiratory rate and heart rate stabilize; baby is able to sleep longer and achieve deep sleep which also results in calmness, less crying and rapid weight gain; more rapid brain development of both alpha waves and delta brushes; and mom's milk production increases. This may also mean shorter hospital stays for baby and parents! Darrell and Amanda were already holding Grayson but not for as long. This challenge gave them the push to hold him more frequently. We heard about the benefits that it has towards the recovery and growing process of children and with all of the obstacles that Grayson has been through, we wanted to do as much as possible. It also allowed Grayson's parents the opportunity to bond with him, we didn't know if we would have (that bond) here and we've become more confident in holding him, along with moving him in and out of his isolate. Aside from the overwhelming health benefits, Alberta Children's Hospital wanted to participate to help NICU parents advocate and feel empowered in their child's care. We decided as a Parent Partnership in Care Committee that this would be an incredible opportunity to partner with families. I've been blown away by the support and involvement from staff and families, states Vigar. Having parents hold their babies even during assessments and for tests like vaccinations is so much more comforting for everyone, explains Vigar. Parents Herman and Lindsey participate in the Kangaroo Chanllenge with their dughter Mia prior to discharge. The Kangaroo Challenge in Canada was first started by Sunnybrook Hospital in Toronto in 2013. Hospitals worldwide register with them, log their hours and submit their hours no later than May 15, 2016. Sunnybrook then announces the winner of the Kangaroo Challenge.